Jiangsu lies in East China and the lower reaches of the Yangtze and Huaihe rivers, with an area of 102,600 square kilometers. 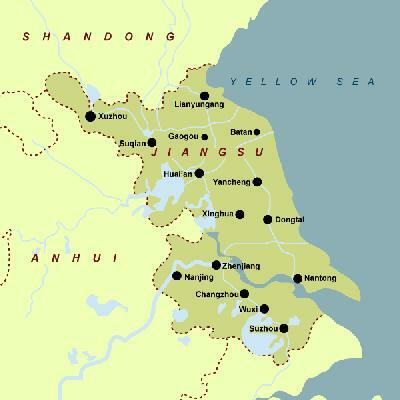 Jiangsu borders the Huanghai Sea in the east, Shandong Province in the north, Anhui Province in the west, and Zhejiang Province in the south. The vast plains, dotted with lakes and crisscrossed by rivers, cover 18% of the province's total land mass. With three major river systems from north to south -- the Yishu River, the Huaihe River and the Yangtze River, Jiangsu has well-developed irrigation systems and shipping. The Grand Canal is an artery between the north and south. Situated in the climatic transition zone of warm-temperate and sub-tropical zones, Jiangsu has mild weather, moderate rainfall and clear-cut seasonal changes. The climate differs between north and south: The mean annual temperature is 13-16oC, increasing from north to south, while the mean annual precipitation is 800-1,200 mm. There are frequent "plum rains" between spring and summer, and typhoon rains between late summer and early autumn. It is divided into 13 prefecture-level cities, 31 county-level cities and 33 counties, with a population of 74.38 million as of 2000. It is one of the most densely populated provinces. Jiangsu specialties include West Lake fish, Nanjing Salted Duck, Lake Tai Whitebait and Beggar's Chicken (the chicken is baked in lotus leaves and clay). The special local products are Suzhou embroidery, Yixing pottery, Yangzhou lacquer ware, Wuxi clay figurine, Nanjing Yuhua Stone (rain flower pebbles), etc. Jiangsu Province, Su for short, lies in East China. The industries and the agriculture here are well developed. Among its agricultural produces, the outputs of rice, cotton, silk, tea, oil and freshwater fish hold important positions in China. Its most important industries are machinery, chemical industry, electricity, electronics and cement. Known as a "land of fish and rice", Jiangsu gets its name from the first character of its two cities, Jiangning (now Nanjing) and Suzhou. Jiangsu boasts the largest number of historical and cultural cities, such as Worldly Heaven Suzhou, Yangzhou, Nanjing, Zhenjiang, Huai'an, and Xuzhou, etc. Of the more than 200 lakes, the larger ones are the Hongze Lake, the West Lake, the Tai Lake, the Xuanwu Lake, and the Gaoyou Lake, which earn Jiangsu the name "Water Countryside". Historical relics include the Stone City in Nanjing, Dr. Sun Yat-sen's Tomb, the Xiao Tomb of the Ming Dynasty (1368-1644), Han Mausoleum and Pits of Terracotta Soldiers, etc. Other places of interest are Yuntai Mountain, Zhongshan Mountain, the Suzhou Garden and the Three Caves in Yixing.